Given: the Quad and the Triangle are contiguous shapes. Given: the Quad and the Triangle do not intersect. Given: a straight line (or lines) could connect The Quad and the Triangle at various points. 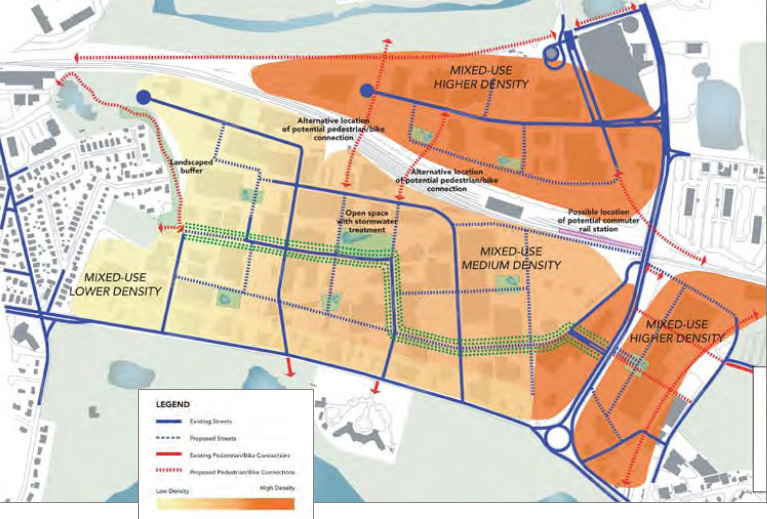 Theorem: Connecting the Quad and the Triangle would dramatically improve circulation, enhance quality of life for residents and commuters, and increase property values in both areas. Proof: The theorem is true Q.E.D., but planning vision and political will to act are sorely lacking. 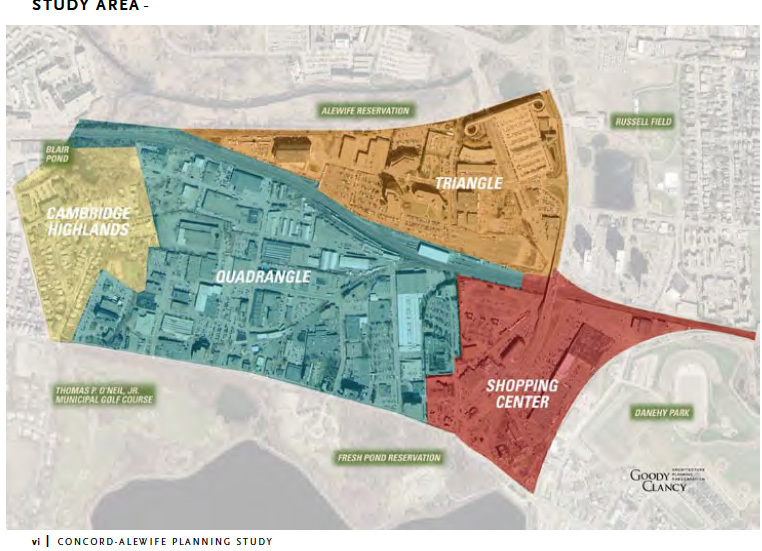 For those not well versed in the geometric jargon of the The Concord Alewife Planning Study, the Quad and the Triangle are the names given to the 190 acres lying west of Alewife Brook Parkway and bounded to the north and south by Concord Avenue and Route 2. They are contiguous but not connected by virtue of the Metro North commuter rail tracks running east-west between them. The Quad (130 acres) and the Triangle (60 acres) present both tremendous opportunities and immense challenges for future planning and development at the western frontier of Cambridge. In the past ten years, these two districts have added almost 2000 units of housing, and at least 1100 more are in the known pipeline. (Note that these numbers don’t include development immediately outside the study area, including large projects and proposals on Rindge Avenue, New Street, Bay State Road, and at the former Tokyo Restaurant site). Yet none of the new vehicle, pedestrian, or bike connections envisioned in the 2005 study has come to pass. A long talked-about pedestrian and bike bridge across the railroad tracks from (somewhere on) Fawcett Street in the Quad to (somewhere on) Cambridge Park Drive in the Triangle is finally being studied, but such a bridge is years — and several million dollars — from completion. 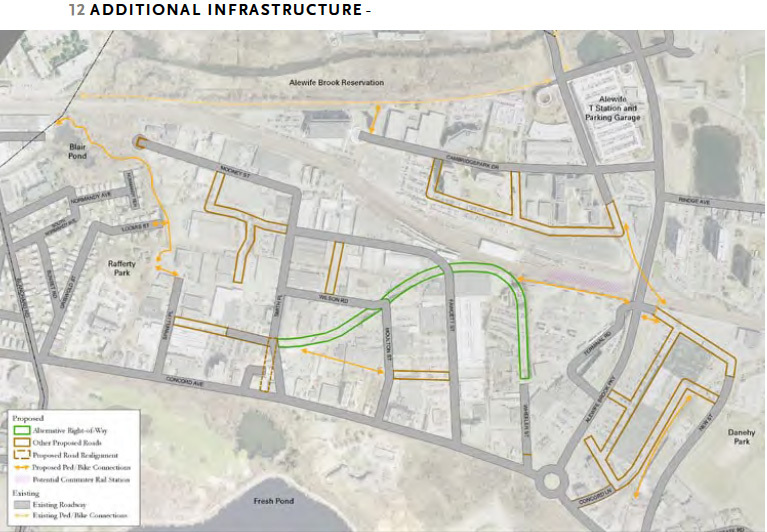 And no one is talking about new connections for cars and buses, even though traffic congestion along Fresh Pond Parkway through Alewife, the rotaries, and beyond is a perennial and growing source of frustration. To insist that traffic on the parkway is a regional problem that Cambridge cannot control ignores the impact that adding thousands of new residents to the Quad and Triangle is bound to have. Even if the majority of these new residents do commute by public transportation, as hoped, many of them will still use cars in their daily lives. And without new crossings, the already overburdened parkway remains the only road connecting the Quad, the Triangle, and all points beyond. The surge in residential development in the Triangle (1000+ new units along the Cambridge Park Drive, plus hundreds more on Route 2,) is appropriately transit-centered, as the Alewife T is easily walkable from within the Triangle district. (To note, Cambridge Park Drive is a cul-de-sac and those buildings and Vox On Two share a single vehicle egress on and off Route 2.) But the massive development spree underway in the Quad cannot be justified until similar connections for pedestrians, cyclists, cars, and buses exist there, as well. Property values in both areas would most certainly increase with improved circulation, so why isn’t the City demanding that developers of these parcels help underwrite the cost of constructing new roads, multi-use paths, and railroad crossings within and between the Quad and the Triangle? 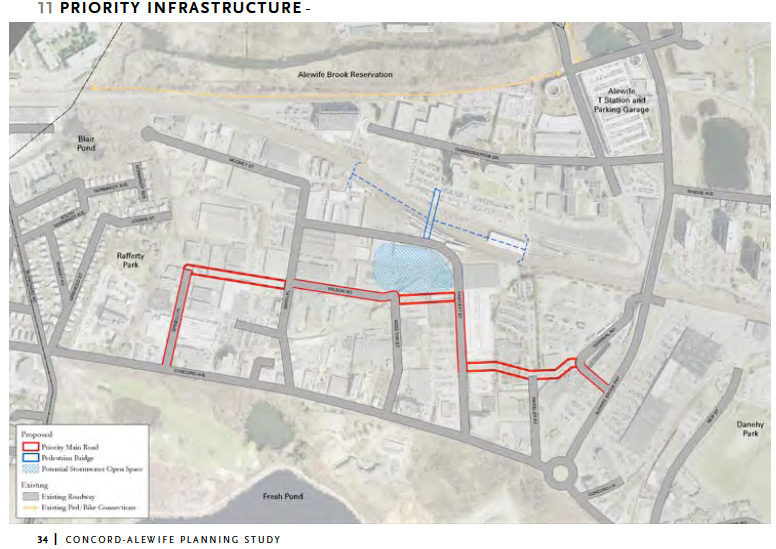 For that matter, with so much new development clustered on both sides of the commuter rail tracks, why isn’t Cambridge pushing Metro North to provide a new rail station at Alewife, similar to what is happening at Boston Landing in Brighton? Such a project would better serve both commuters transiting the Route 2 corridor and the many new local residents moving into the area. In the end, the lack of connections reveals a failure of both vision and political will. It’s not a geometry or an engineering problem, or even a budgetary matter. No, it’s simply the Great Alewife Disconnect, and it’s a crying shame. These new connections were are “priority” a decade ago so why don’t they exist today? Additional infrastructure included in the 2005 planning study hasn’t come to fruition. 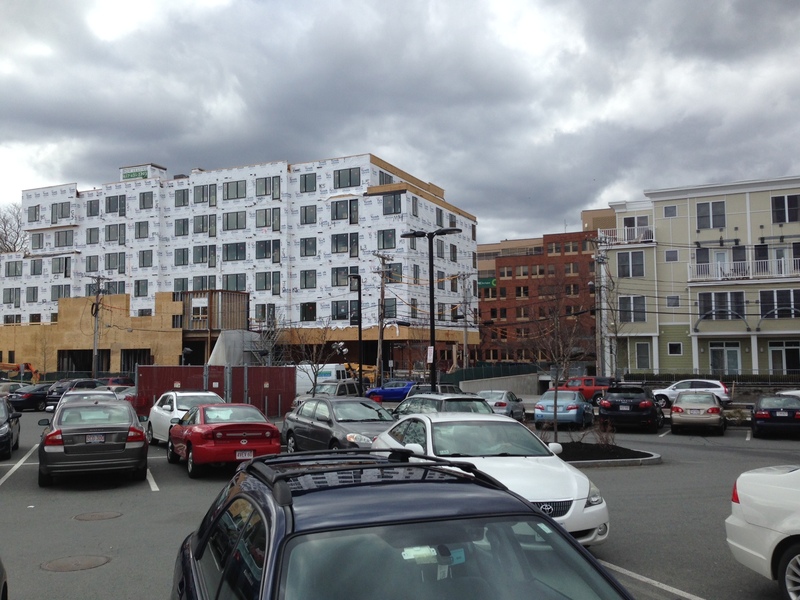 The expression “There’s no there there” sums up the recent surge of residential development in the Alewife area. Merely adding thousands of units of housing does not make a new neighborhood if there’s no overarching vision or investment in creating a strong sense of place and community. A master plan would help define a vision for Cambridge’s “Final Frontier,” but the city doesn’t have one, despite our Community Development Department’s insistence that a zoning map, an growth policy document, and a patchwork of area planning studies are the equivalent. 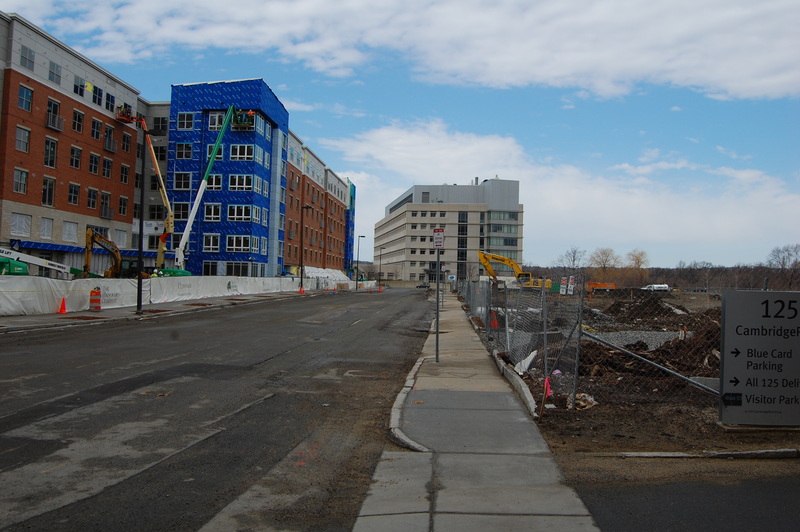 Without a comprehensive master plan to guide, coordinate and balance development, Alewife has become a magnet for what a friend calls “spaceships” – giant apartment buildings that have landed on formerly industrial streets. Spaceship buildings are inward-facing, self-contained housing pods that contribute little to the public domain. Spaceship buildings don’t create an urban community because this type of single-purpose development doesn’t give residents the opportunity to do “very different things” near where they live. 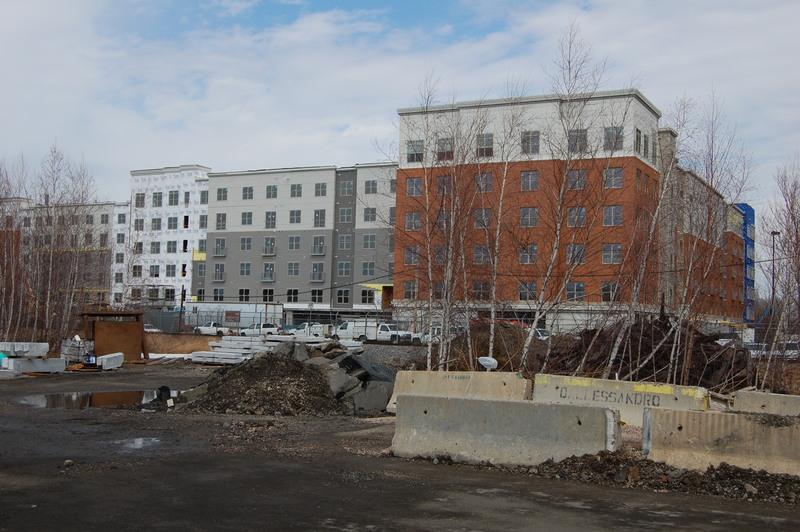 Since 2004, we have added over 2.4 million square feet of housing in the Alewife/Fresh Pond area, almost three times the amount of new retail and commercial space combined during the same period. This is almost twice the amount of residential development that the Concord Alewife Planning study projected would be built by 2024. Yet there are no new town squares with stores, restaurants and services, no new community centers, schools or churches, no new playgrounds or parks. There are the all-important “third places” that neighborhoods need to survive and thrive (the first and second places are homes and offices). There is no master plan to say where such community-building amenities are most needed and where they should be located, and no financial incentive for anyone to build them. The profit is in building housing, specifically small luxury units in developments that maximize the density allowed by up-zoning and special permits, which incentivize the conversion of formerly industrial sites to residential use. That part of the 2005 Concord Alewife planning study is working quite well, thank you. The rest, not so much. So, what we are left with is spaceships – plus another City Council meeting on Monday, April 28, when the debate will continue about whether we need a master plan and, if so, which city officials (the Council or the CDD) should lead the initiative. Expect more spaceships because, so far, no one is pressing for limits on up-zoning and special permits during the two to three years it could take until we have a master plan in hand. Fawcett Street. Iggy’s bakery is on the right, where the cars are parked. 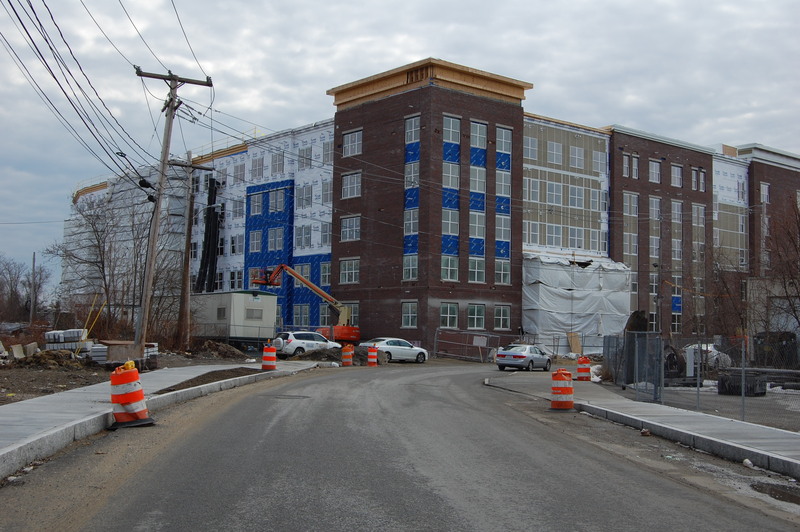 Walking along Fawcett Street from the new Atmark apartment building (429 units) to Iggy’s bakery, one notices that there are freshly poured sidewalks and new curbstones. 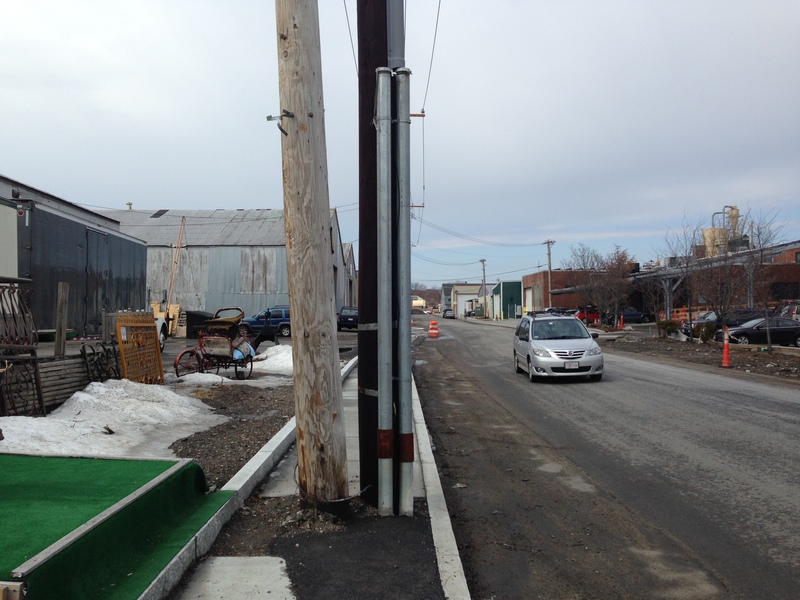 Unfortunately these utility poles could not be moved….sigh.